Okay, this is going to be a looonnng post. Justin and Alissa had their wedding reception at the Detroit Science Center. It turns out that the venue was unveiling a new Star Trek exhibit. The facility ran a contest, for every couple that proposed on opening day would be entered into a drawing for a free wedding. There were 6 couple that participated, some drove across the country to propose on their front steps. It was Justin and Alissa that won a complimentary reception in their Star Trek exhibit. The couple hired Encore to provide the DJ entertainment for their wedding reception. However, this reception was FAR from ordinary… Since it was being held in the Star Trek exhibit, the couple request dozens of space related songs. Some were remixes of classics, and some were completely unknown. It was a challenge to accommodate their tastes while catering to the needs of their guests. 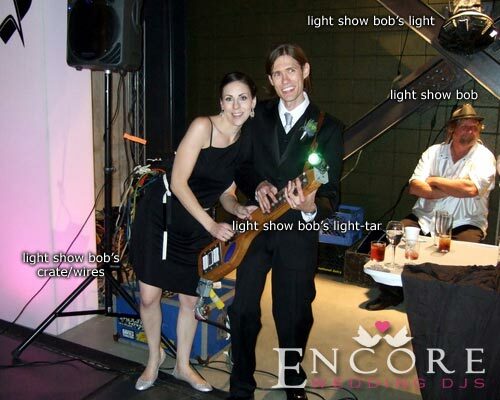 If you noticed in the photo above, they hired a gentleman named light show Bob to provide the lighting and trussing for their wedding reception. What was really interesting, was that he used his custom creation called a light-tar (get it… guitar light-tar) to control the scenes of the fixtures. I believe the light-tar is the first of its kind that is dimmer capable. The groom even got up on stage at one point to try to master the light-tar. Unfortunately we weren’t able to provide the lighting design for Justin and Alissa since they booked light show Bob first 🙁 But for those of you that are curious what we can do with lighting design, checkout this link here. The wedding planner is working, and she had no right to request music as if she were a guest… even songs that were specifically asked to be avoided. Just to let you know, the wedding planner apologized and we got the check minutes later. This just goes to show you that not all vendors are in your corner. Our goal is to make sure your other vendors do a great job for you. Even if we have to put them in line 🙂 I know this post is getting long, so I am going to wrap it up. Alissa and Justin were a phenomenal couple with lots of character!